Ponchos, caftans and kimono tops are back now in all available sizes! Yay! Welcome to our shop! Take some time to look around and be inspired! We have clothing for all ages in all colors and in amazing fabrics. Inspiring Color started as a mother-son tie dye team inspired by color! We're happy to have you in our shop. Most of our items are custom-made by size and design. Please let us know how we can help! *Please read important information in our profile section on care for your garments once you receive them. We also include this information with your garment when it is shipped. Perfect! Fits great and it was just what I was looking for! This is my third purchase and im sure ill return. Thank you so much! Perfect I. Love the colors and it fits great! Thank you so much! I love this top! Fits perfect and I love the colors. Thank you so much! 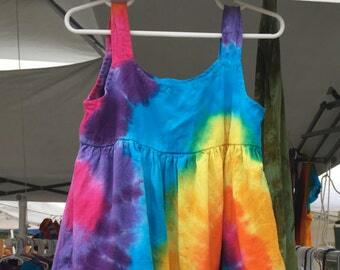 New bamboo/cotton one-pieces in a variety of brilliant colors! Father and sons kayaking in Inspiringcolor t-shirts! That's Zach with the paddle. Inspiring Color started in the spring of 2007. 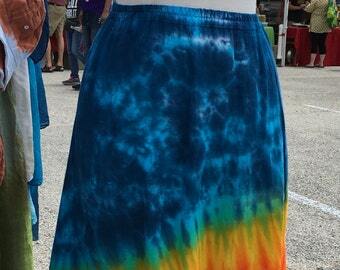 Zach and Jill Matteson, a mother/son team, started tie dyeing clothing to raise money to support Zach's budding violin talent -- primarily to help pay for summer music programs. We loved the color and process so much, the name and the business was born! Now, Zach is a professional violinist working and studying at the Butler School of Music in Austin, Texas. His quartet, Invoke, occasionally enjoys sporting an Inspiringcolor t-shirt -- and he remains my chief artistic consultant. Now, his little brother, Zephan, is helping and learning the ropes. Inspiring Color recently moved from the little town of Luling, Texas -- home of the annual Watermelon Thump festival and inspiration for our watermelon designs -- to a beautiful historic city of Havre de Grace, Maryland. Check out our new shop video to see the location and learn about the process! Welcome to our shop! 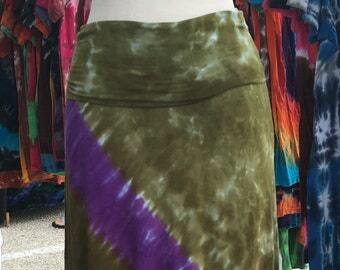 We strive to create high-quality stunning tie-dye that our customers will love and that will last and last. We do our best to use the highest quality shirts, garments, fabrics and dyes. 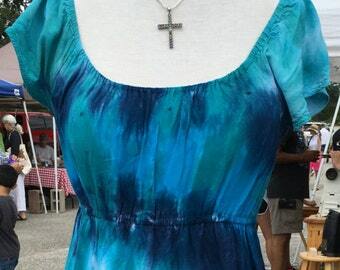 All of our items, unless specifically noted, are custom dyed for you by size and color. 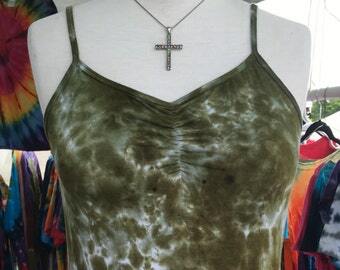 The pictures serve as examples of the item, but each one be uniquely yours -- same design and colors, but in your size and uniquely dyed. This process takes a little longer, as we keep a small inventory, so we have 1-2 week turnaround on most items (some a little longer such as sheets and sweatshirts/hoodies). If you need something rushed or for a specific date, please let us know and will do everything we can to accommodate you. We dye using fiber reactive dye. It's a chemical process that actually changes the color of the fibers, making them colorfast. We wash our garments twice after dying, once using a special textile detergent to remove excess dye and a second time with vinegar and fabric softener. Altogether, the garments are washed twice times in hot water and rinsed six times, creating preshrunk and colorfast items. Nevertheless, despite all of our precautions, occasionally there will be some residual dye left in your garment. To avoid staining, make sure you machine wash clothing in warm water with like colors and don't leave the them sitting wet in the washer or dripping dry. 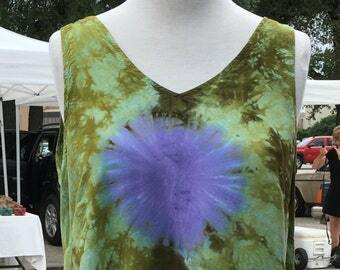 If there is residual dye, it can transfer to other clothing or muddle the design on the tie dye. This care should only be necessary the first two or three times you wash and you should feel confident afterwards. If in doubt, you can test by throwing an old white sock or rag in the washer. Special Note: Silk and rayon garments, scarves, veils, etc. should be machine washed on delicate in a mesh garment bag and left to air dry. If you choose to handwash and there is bleeding the first few times, be sure to rinse until the water runs clear and blot well or spin the excess water out to avoid dripping. It's Very Important to note that the bleeding, if it occurs, is only residual non-reacted dye. Your garment is not fading and will be bold and stunning for the lifetime of the garment. We are happy to exchange or refund for items that aren't the right fit or design of your choice or other reasons. We do require an exchange/refund within 30 days of payment received. The item needs to be in as new condition, clean and unworn (except for the intial trying on). We hope this situation doesn't occur, but we desire your satisfaction and will be happy to discuss any concerns you have. Our preferred method of payment is through Paypal and credit card. You can also choose to pay by check or money order. Please contact us if you have any questions. We ship via USPS priority mail and 1st class domestic and international. We use delivery confirmation on Priority Mail domestic shipments, but are unable to provide delivery confirmation on regular 1st Class International orders. International customers are responsible for any custom taxes and should take this cost into consideration before ordering. All of our t-shirts, scarves, camisoles, veils, children's clothing t-shirts, one-pieces and caps and dog clothing are shipped 1st Class domestic. All other items are shipped USPS Priority Mail unless otherwise noted. If a garment is listed as piority mail and you would prefer regular 1st class, just let us know. We are happy to accomodate your request. Finally, if your Paypal and Etsy address/name differ, please indicate in your "message from buyer" which address to send your purchase to. Ready-made items are shipped within 48 hours. Friday-Sunday orders are shipped on Monday. Custom-made items are shipped within two-weeks of payment. We will contact you if there is any difference in this policy and when your item has been shipped. On large orders, we will use UPS domestically as it is the less expensive method. We love to work with our customers on custom orders. Our preferred method for custom orders is via a private alchemy request; however, we're open to your requests and will also make private listings for you. Just send us a convo with your requests. We accept consignment and wholesale for our infant items and are willing to discuss other offers.